Happy Monday everyone!! 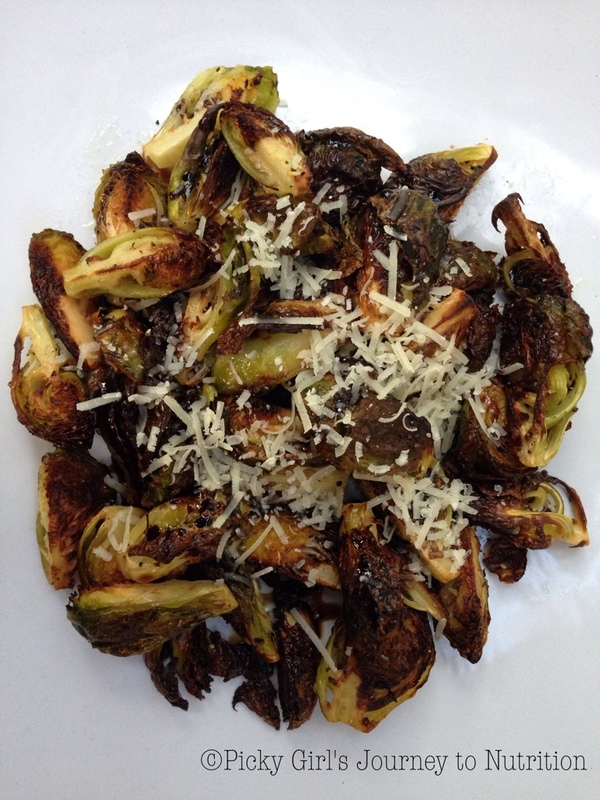 One of my dad’s favorite foods is Brussels sprouts, so we had to add them to the menu this weekend for Father’s Day. I have to say that when I was younger I didn’t care for them, but now I love them just as much as he does! This time we tried something a little bit different with the Brussels sprouts and they turned out delicious; they even ended up being the favorite dish of the night! 2. Rinse Brussels sprouts, remove outer leaves, trim the end of the stem, and slice into quarters length-wise. 3. Toss with olive oil, just enough to coat evenly. 4. Spread sprouts onto baking sheet and sprinkle lightly with salt and pepper. 5. Put in oven and bake about 30 minutes or until they are just beginning to caramelize. 6. Remove from the oven, drizzle with balsamic glaze, and sprinkle with parmesan cheese. Not only do Brussels sprouts taste good, they are also good for you! They are good sources of Vitamins K and C.
Hope that you enjoy this recipe as much as we did and happy belated Father’s Day to all the dads out there! Can’t wait for you to return to be one of my taste testers again! Wow now I got my WordPress pw figured out I can contribute! Brussels sprouts must be the last sign you are no longer picky! I order them every time I see them on a menu. I cook them a lot too. Always a hit.